> Already using Microsoft Outlook and / or Microsoft OneNote on a daily basis? > Want to learn how to integrate both to manage your supplier relationships? 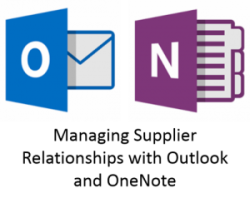 If your already using Outlook you be familiar with the email, calendar, contacts and tasks functionality and if you use OneNote you'd know about the basic note taking features - but did you know that these systems can be seamlessly integrated to create a powerful tool for managing any supplier or service provider relationship? As a professional supply chain manager with over 30 years’ experience establishing, managing and developing relationships with countless 3rd Party Logistics (3PL) service providers and apparel manufacturing factories around the globe I have always struggled to find a single platform that could cater for all of the different tasks that I need to perform as part of my role. I have tried integrating Outlook with Evernote and using Word and Excel to capture notes, action items and to assign tasks but by combining the functionality of Outlook with the OneNote add-in I have developed an intuitive and robust solution for managing both the day to day and the strategic requirements of any supplier relationship. Although it has taken me many years to refine my supplier management process, this guide will provide you with a shortcut to a proven framework and a series of step by step instructions on how to set up and integrate both applications to create an effective solution for managing any supplier relationship. The guide is based on a sample of the OneNote Notebook structure that I actually use for managing all of my 3rd Party Logistics (3PL) Service Providers relationships. What is covered in this guide is not intended to provide a definitive guide to the full capabilities of each application but will highlight how Outlook and OneNote can be put to practical use in a real world situation - in this case - how supply chain professionals can take a familiar set of tools and manage any supplier or service provider relationship in a highly effective manner. Enter you details below to receive a FREE copy of the guide.